Here you will learn to create a countdown timer which counts down from the current date and time to a specific date and time in the future. This example will use days, hours, minutes, seconds and even milliseconds retrieved from Flash's Date object to calculate that countdown. But, not only will you learn what is needed to calculate that countdown; you will also learn how to incorporate custom images to represent your numbers in that countdown. Then there's the coding to make it all work, which actually has some tricks of its own as well. I'll explain the creation of the graphics as they were made in Photoshop and Image Ready before imported in Flash. In Flash is where the Actionscript is added to make the timer to use those graphics in displaying the countdown for your date. The actual making of the graphics is nothing special. All you really need is 10 numbers of 0 through 9 and any kind of character you want to use to separate them in the final countdown (if any). This example uses a period for separation though a colon (:) is quite common. Other desired graphics you would also want to include. Next, switch over to Imageready and slice up your image into individual elements. You will want to do this division here and not in Flash as it will save you a lot in file size in the long run. Each digit will need to be its own slice and, to make it easier on yourself later, preferably all the same size. Before you start exporting from here, however, you should consider naming your slices. This will no only make it easier to determine what is what when dealing with your images, but you can also make importing a little easier on yourself. The above naming is used so that Flash will see those images as a sequence and import them frame by frame into the movieclip in which they will be imported. The easiest way to accomplish this in ImageReady is to just give the slices of your numbers names which are the number itself. Now you can exporting those images. Be sure to set up a custom export settings (Other...) which will let you specify an export name of some prefix + sliceName + .ext so the number slices will get proper names relating to their sequence. If you want, you can select only the slices you've created and only export selected; otherwise other non-essential slices will be exported with everything else. However, since those slices weren't named, they will be easy to weed out when importing the wanted slices into Flash. With the imagery finished, you can begin importing them into Flash. So fire up Flash and begin importing. All images aside from the numbers 0 - 9 can be imported directly into the library. Those numbers, however, are going to be imported as a sequence in their own movieclip. So make a new movieclip calling it "numbers" and import your 0 image. For the most part, all that really remains graphically is setting up the countdown clip itself. This clip will consist of one of these numbers movieclips for each digit it needs to display in the countdown. Then, as Flash calculates the countdown, it will tell each of these numbers movieclips to go to the correct frame representing the number they need to display. To display 0, for example, a numbers movieclip would need to go to and stop at frame one, etc. Make a new movieclip and call it something like "counter." This movieclip will contain those numbers movieclips for each number in the counter. This example uses 3 digits for days, 2 for each hours, minutes and seconds and another 3 for milliseconds. 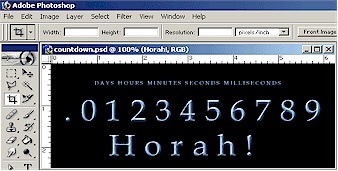 Add in the numbers movieclips and any other graphics symbols you may need such as the periods separating the numbers. In importing the numbers we used a trick to make it easier for those numbers to be automatically imported frame by frame in Flash making it easier on importing process. This tutorial will continue to use such tricks as making life easier is always, I think, a good thing. That leads us to the big trick of this example which is the process used in identifying each digit in the countdown. What this relies on is the names of each of the numbers movieclips in the counter clip. For example. The variable which is going to be used to count the days will be called days. For the first numbers movieclip making up days in the countdown, it represents the first character in the days total 3 digits or, in Flash, 0 - relating to charAt(0). So, the name for that movieclip will be days + underscore + 0 or days_0. Now just throw this counter movieclip in frame 1, add the DAYS, HOURS, MINUTES, SECONDS and MILLISECONDS images to label each part, throw the Hoorah! in frame 2, set your play head back to frame 1 and begin coding! You have just finished the graphical portion of this tutorial. Before you start rejoicing, we haven't touched the coding aspect of the animation yet. The coding for your countdown timer will begin on the next page.